This morning for Imbolc I lit a candle that had previously been lit from a sacred flame passed on hand-to-hand from one lit at Brigid's Flame in Kildare, Ireland. In Kildare there is ancient fire temple where a perpetual flame for Brigid was once kept alight. Brigid is honoured as both a Goddess by pagans and as a Christian saint - her name is sometimes spelled Brigit or Brighid. Although the original flame was historically extinguished, it was symbolically relit in 1993. A small fire is often kindled at the site of the fire temple for a ritual on Brigid’s feast day on February 1. Candles lit from that flame have been passed on, lighting other candles in turn as a shared light from the same source. I was given this little Brigid's Flame candle by a druid friend, Ricky, last week. I placed it in one of the holders I made a couple of weeks ago. 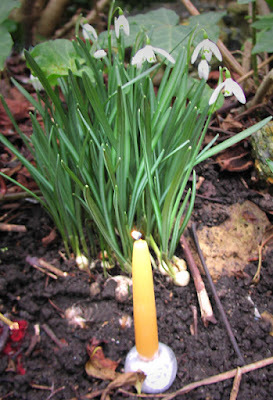 I honoured this day by lighting it in my garden where snowdrops are just starting to emerge. For pagans, Imbolc is the festival of the first stirrings of spring - and snowdrops are among the first flowers to bloom. Brigid is seen as a goddess of the springtime and of healing, poetry and the fires of the smith's forge and creativity. You can find out more about sacred flames in my new book Pagan Portals - Candle Magic.